I am all about easy. Seriously. I am not into complicated processes, and that is true for what happens in my kitchen as well. I absolutely love to cook, but if it is going to be a long drawn out ordeal, I will opt for the peanut butter and jelly sandwich so that I can enjoy other aspects of my life, like my chickens, garden, quilting and family; not in that particular order, obviously! But isn’t it wonderful when you can put a meal in front of your family or your sweetheart that just screams: SHE IS A CULINARY GODDESS! Prior to learning how to make and the falling in love with crepes, my repertoire of French cuisine consisted mainly of French fries, French dressing, and the occasional croissant. That’s it. 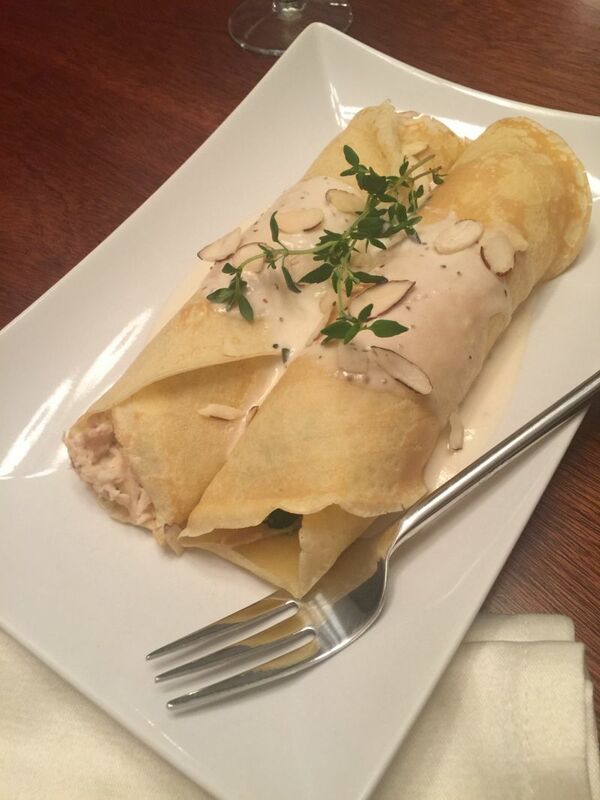 Now everything can be a French dish because you can put absolutely anything in a crepe! It can be a breakfast dish, lunch time snack, or a gorgeous evening meal. And the real beauty of crepes is that you can make them ahead, and keep them in the refrigerator–just pull them out, fill them, and serve. It’s like being a French magician! 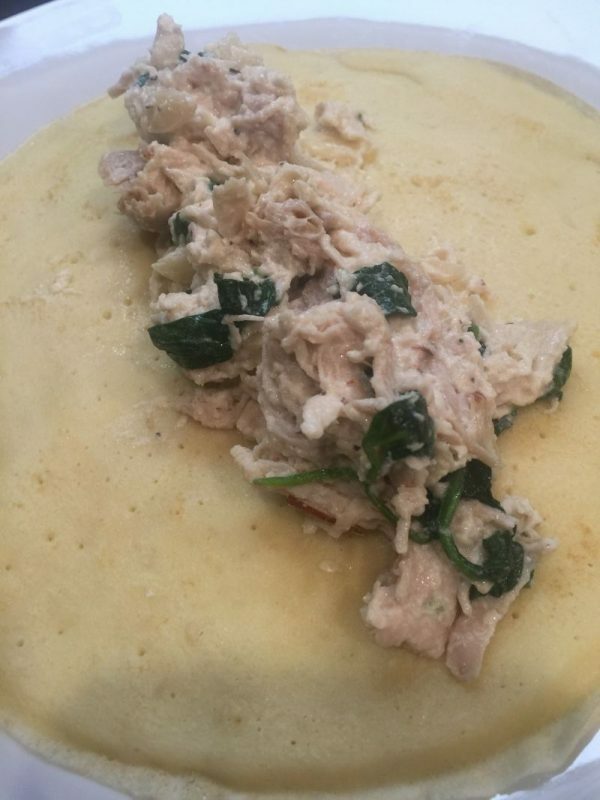 This week’s post is for a spectacular Chicken & Spinach Crepe with a delicate wine sauce. I wish I could see your face when you take your first bite: because it’s a party in your mouth. 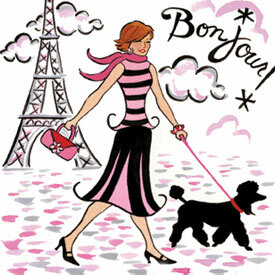 It is Magnifique! 1. Put all the ingredients for the crepes in a mixing bowl and whisk until smooth. You don’t want any lumps. 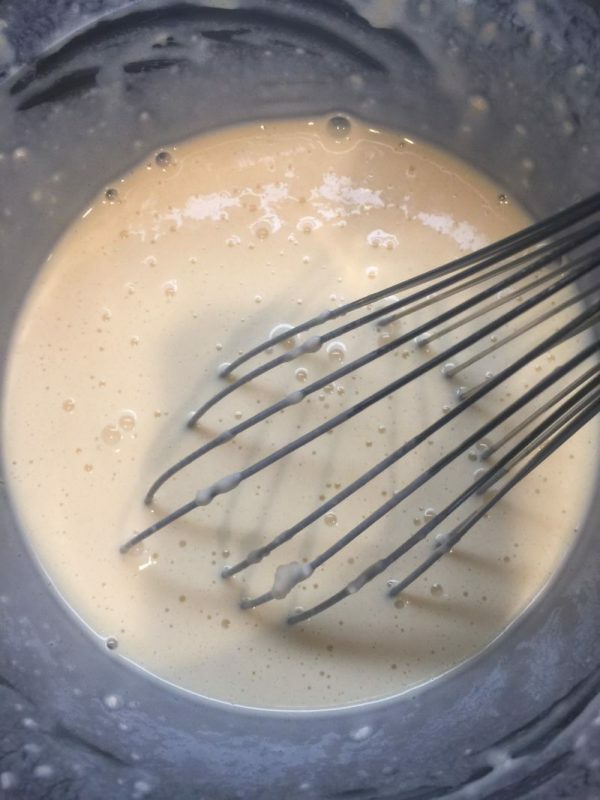 I use a hand mixer because it’s faster and I get a velvety smooth batter. 2. Put a dollop of butter or oil in a non-stick 8″ skillet and rub it around with a paper towel. You just want a very light coat. 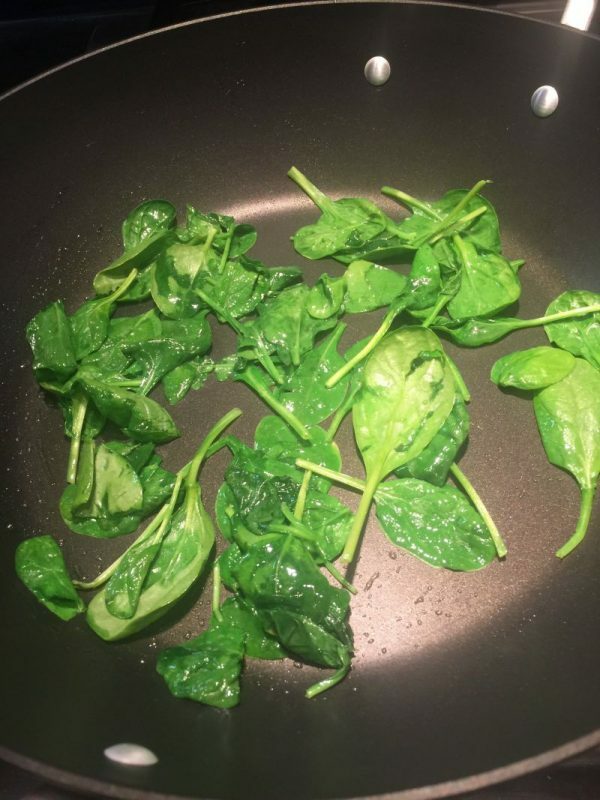 If you are using a skillet that tolerates cooking spray, you can use that. One treatment of the pan will be good for several crepes. Put the skillet on medium-high heat. 3. Once heated, use a 1/3 cup measuring cup, and scoop out 1/3 cup of batter and pour it in the middle of the heated skillet. 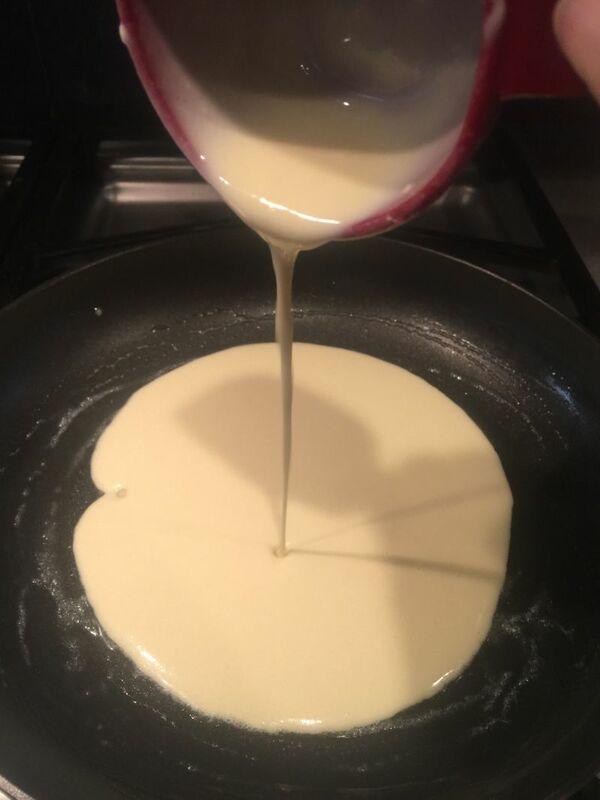 Immediately pick it up and swirl it around to make a round puddle of batter that fills the bottom of the skillet. Place back on the heat and let it cook. The edges will cook first and start to curl a little. As the top of the crepe becomes more solid and less runny, lift the edge of the crepe up with a rubber spatula and check the bottom. It should be turning a light, golden brown. This only takes about a minute or a minute and a half, so don’t step away from the stove. When the top is no longer runny, turn up the edge and pick it up with your fingers and turn it over in the pan. Another 30-45 seconds on that side will be perfect. 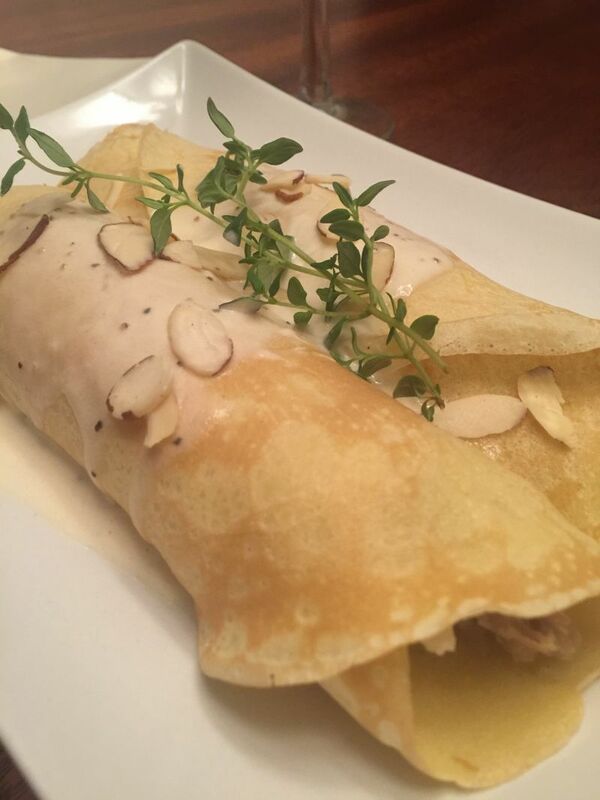 Slide the crepe out on a plate and repeat until all of your crepes are finished! Adjust your heat if needed higher or lower so you don’t overcook or undercook your crepe. 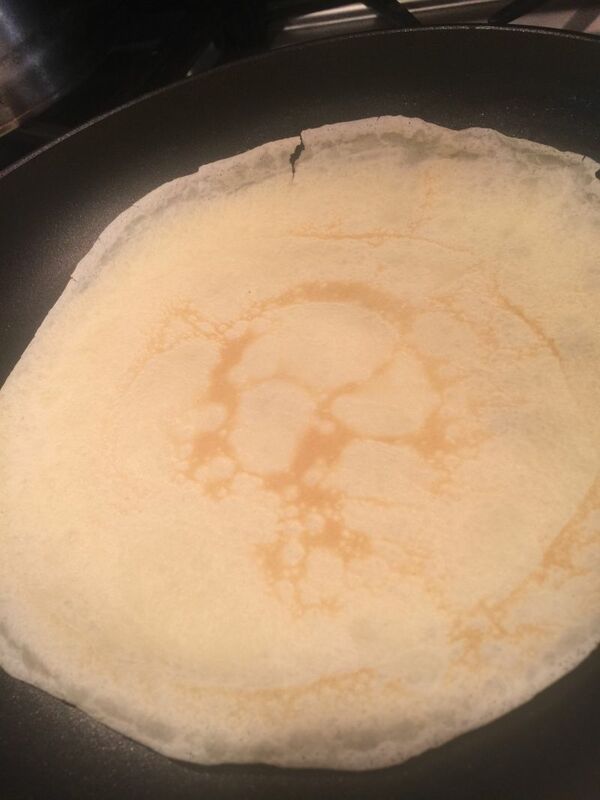 You don’t want it to brown too much, or your crepe will crack when you roll or fold it. If undercooked, you will end up with the crepe’s eggy mixture running all down your fingers and pan. Don’t worry, you will get the hang of it fast. You can make these ahead and put in an airtight container for use later, or cover the plate with plastic wrap or foil and put in the refrigerator. 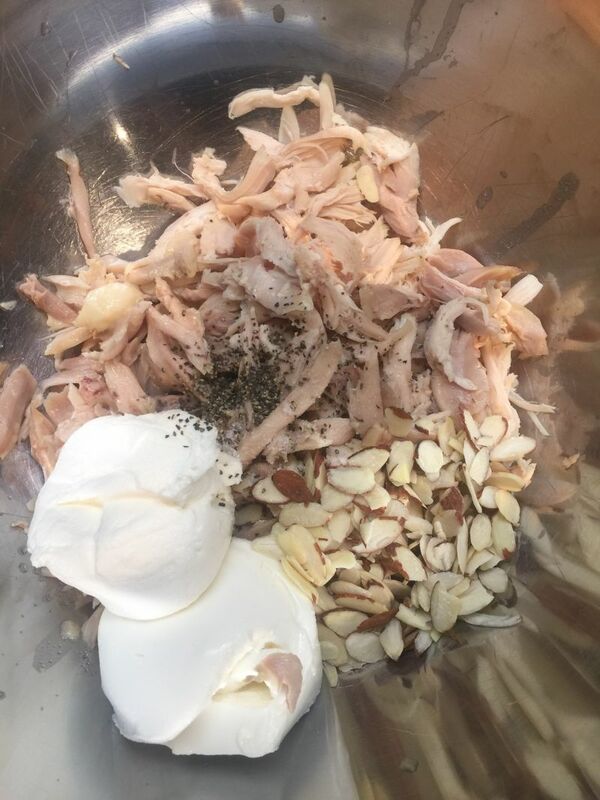 Now it’s time to make the filling, and since I like fast and easy, I purchased a $5 roasted chicken at the market on the way home from work. I like the added subtle flavor of the roasted chicken. 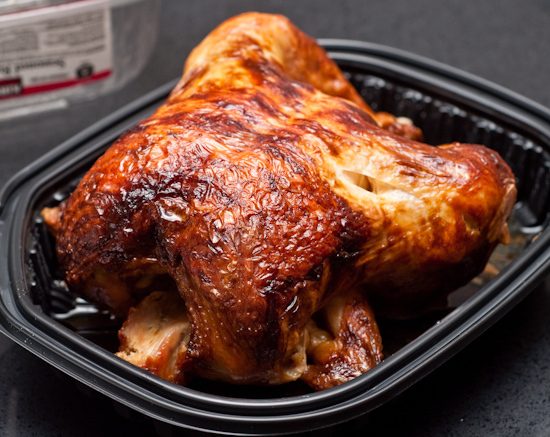 Remove all the skin and bones, and shred the chicken meat in a large bowl. If you cooked a chicken breast, cut it up and shred it. 1. 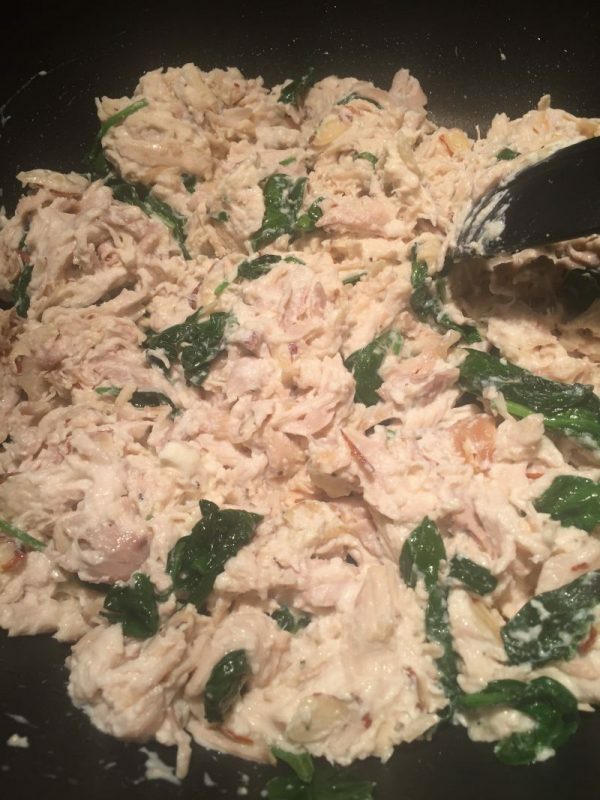 Place the shredded chicken meat in a large bowl, add the fresh lemon juice, ricotta cheese, garlic, salt and pepper, and fold together with a rubber spatula. 2. Fold in the sliced almonds and set aside. 3. Heat a large pan and drizzle with a bit of olive oil. Toss in the fresh baby spinach and heat until the spinach wilts a bit. Turn the heat down to a low/medium heat. 4. Add the chicken mixture and gently fold together until hot through. You can turn off the heat and cover with a lid to keep warm. 1. In a small pan, melt the butter. 2. Add the wine, stir and heat through. Now it’s time to assemble the crepes. Take one crepe and place on a plate, counter or cutting board. 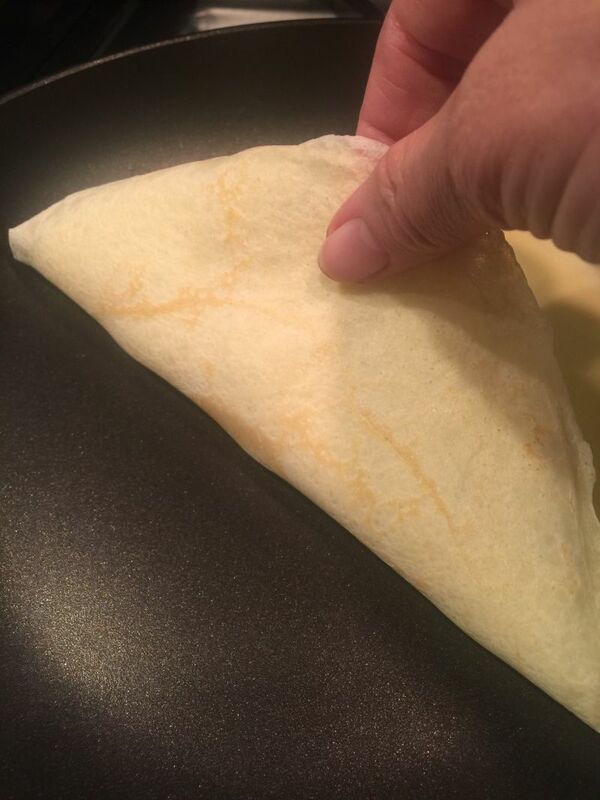 Put a large spoonful of filling (about 1/4 to 1/3 cup) in the middle of the crepe and form into a log shape. 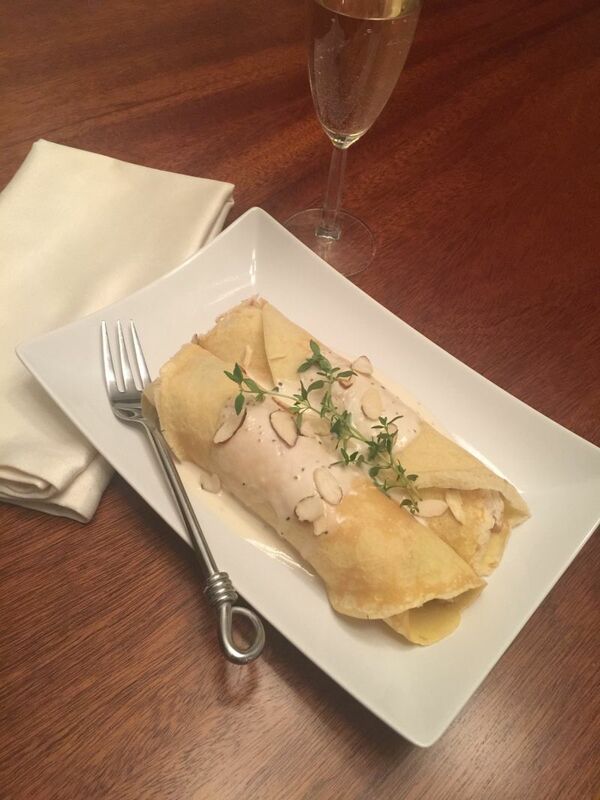 Roll the crepe and set aside. Repeat until all of your crepes are full. 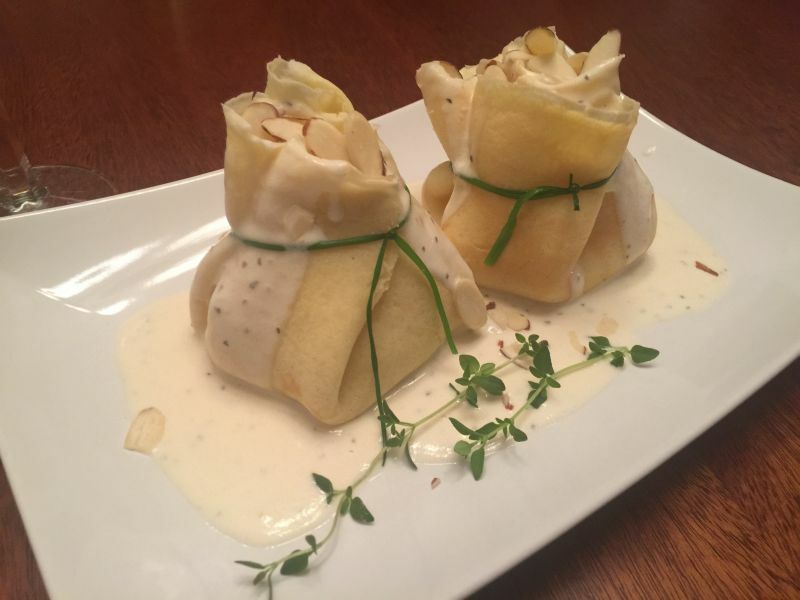 Place individually on a plate and pour the sauce over the top of the crepe, sprinkle with sliced almonds, and garnish with a sprig of fresh thyme. Viola! I have also made a platter of these and placed on the table, arranged side by side and covered with the sauce and garnished, and they are spectacular. Your guests can just serve themselves using a pretty spatula. Alternatively, you can place a spoon of filling in the center of a crepe and bring up with your fingers and form a pouch. Tie it with a blanched green onion or chive. 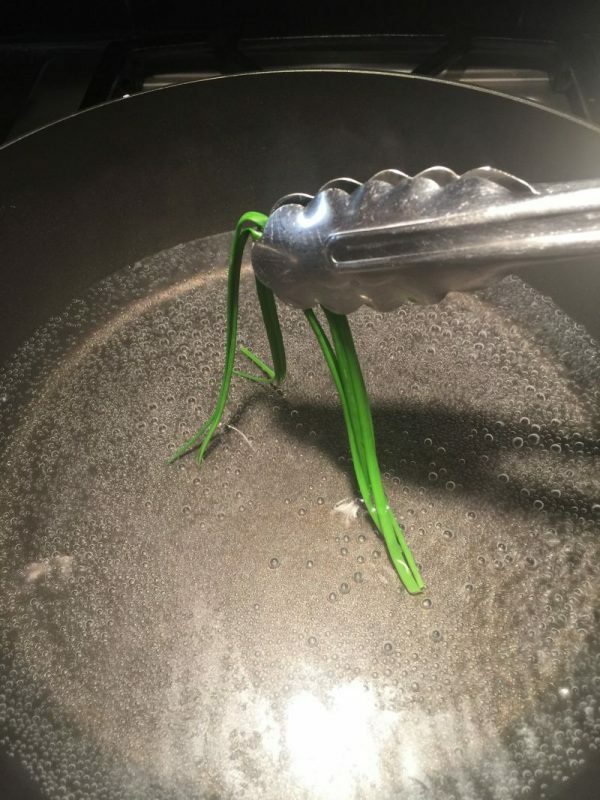 To blanch the chive or green onion, simply lay it in a pan of boiling water for about 15 seconds and remove with tongs. They will by pliable enough to tie your bundle with. Cover your pouch with sauce and garnish with almonds, leaving the little pouch in a puddle of wine sauce. You will get 16 pouches if you do it this way, so make a double batch of crepes! I might add that these are delicious heated over, and reheat beautifully in the microwave. My husband takes a crepe with a separate little container of sauce to work for lunch, and heats it up! **In the interest of saving time and $$, let me share a product I use that I just LOVE! 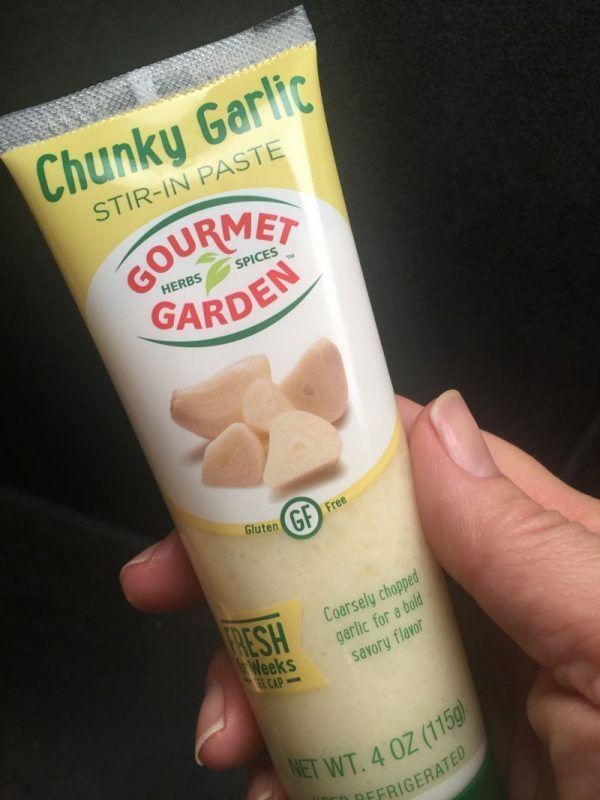 In the recipe you see I mention garlic paste, and this is what I use. You can find it in the supermarket in the produce section, and it stores in the refrigerator. I prefer the chunky paste, but it does come in a smooth variety also. This recipe is a wonderful way to use up leftover chicken! California Girl comments: This week’s recipe is special and you will wow your guests with this beauty. It is only fitting that I pair a french dish with a classic french wine. I decided on a bottle of Pouilly Fuisse. It is among the white wines from the Burgandy part of France. Here is a secret: even though it sounds fancy, it’s Chardonnay. 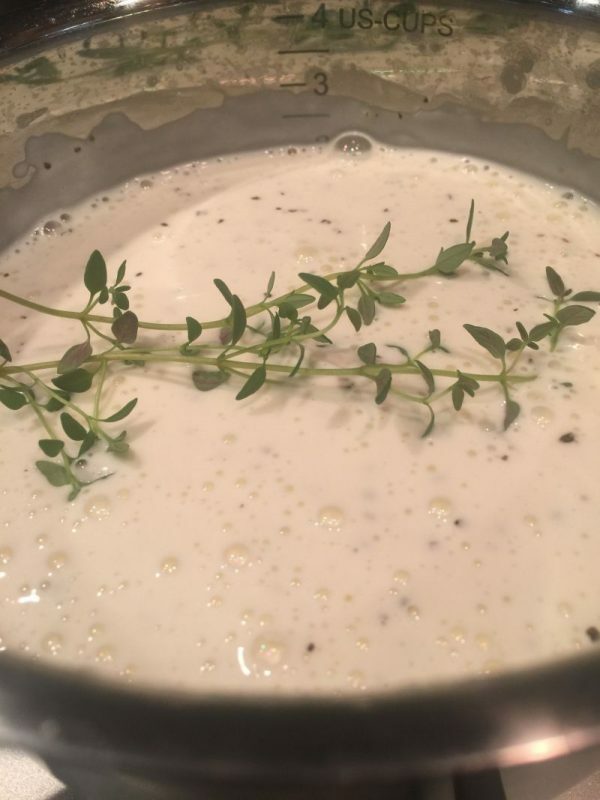 The characters of this wine have strong fruits and subtle oak flavors which will pair perfectly with not only with the chicken but with the cream of the sauce and the flavor of the thyme. The particular bottle I chose was from Costco and cost $13.99. 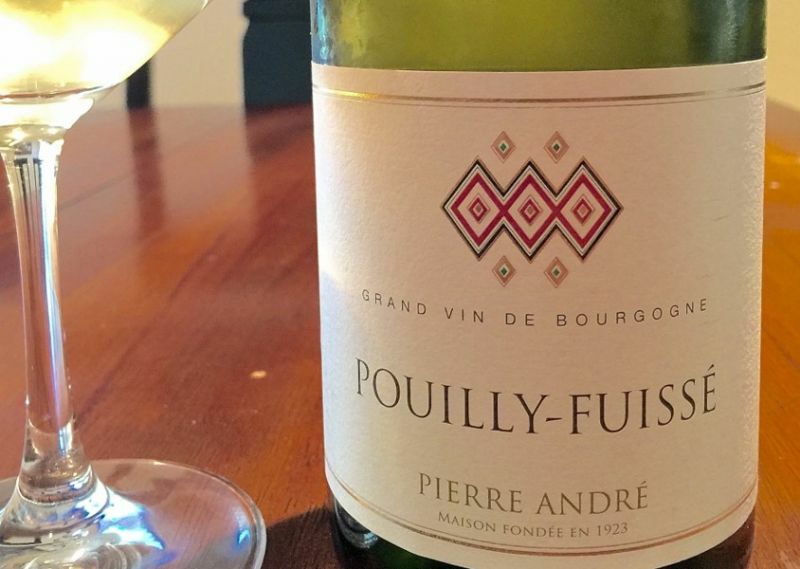 If you can’t get your hands on a bottle any good chardonnay will do (even if it isn’t French). You are so right, They are super easy but they are time consuming.